Girl Guides & Girl Scouts Patch Collecting Blog: What’s your Holy Grail of Girl Guide or Girl Scout collectibles? What’s your Holy Grail of Girl Guide or Girl Scout collectibles? From the first moment I spied the listing, I knew the bidding was going to sky rocket. I’ve been following Girl Guide auctions closely on eBay for a year and a half now and I had never seen one of these babies pop up before. Though they were not uncommon during the time when Guides were eligible to achieve them, they are highly sought after now. What am I talking about, you may ask? 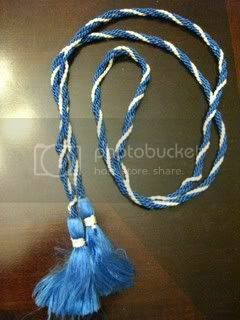 A blue and white All-Round Cord (sometimes also called an "All-Around Cord"). While I have one All-Round Cord pin (the version with the modern GGC trefoil), I do not thus far have the tasselled, satiny royal blue and snow white hued cord itself. But goodness knows I want one. As the week progressed I watch the listing price climb higher and higher, first $10 then $20, by early Saturday afternoon it was $40 and I knew that no matter how much I longed to add that cord to my collection, unless I won a lottery before day was over, there was no way I could even debate bidding on it. And so long after the sun had set, I watched one of my most sought after Girl Guide items sell for $44 US. In these modern days of eBay anonymity I have no clue who the lucky winner was, but I truly hope that they will treasure the cord as much as I would have. Having joined the world of Guiding as a Pathfinder I missed out on the opportunity to achieve earning the All-Round Cord. As a Pathfinder I’d sometimes see one lopped proudly through the epaulet on a Guide’s shoulder and secretly think to myself how gorgeous it was and how wonderful it must have been to earn such an esteemed piece of insignia. I went on to achieve the Canada Cord, the highest level of award that a Pathfinder can earn, and love that beautiful crimson and white cord (and pin) with a passion, but I still can’t help yearning for an All-Round Cord. As a Girl Guide and Girl Scout enthusiast with a broad range of interests in terms of what I collect (patches, earned badges, pins, scarves, etc) my wish list of items that I hope to one day be able to find continually grows in size seemingly by the day, but no matter how many items I’ve got my eye open – or hope to trade – for, there are certain few that have the ability to truly set my heart a flutter in that particular way that only the most pined for treasures can. Amongst collectors of all sorts, these kinds of items are sometimes referred to as your “Holy Grails”, as their scarcity, price point or some other element make them illusively hard to get your hands on. For me such items include Ranger Badges (http://www.guidingproject.info/catalogue/rangers.html) (I am immensely fortunate to have a couple, but need numerous others), A/D/D patches from the Yukon and NWT/Nunavut, A/D/Ds from my home town and the areas around where I spent my childhood Guiding years (in the Okanagan Valley of British Columbia) – and as you already know from this post, an All-Round Cord. post. Image by 2splats on eBay. Wow, that All Round Cord sure went for a lot. There are a few items that seem to fetch high prices. I hope you find one though. Thank you for your comment, ennadoolf :) Yes, even now a week or so after that auction ended, I'm still picking my jaw up off the floor over how much the All Round Cord sold for. I can only hope that another one will pop up on eBay one day and that I'll have better luck with that one. Thanks again for commenting & have a fantastic weekend! 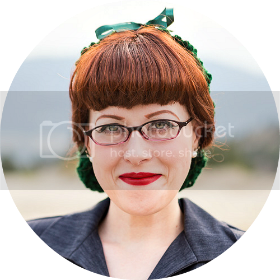 I happen to come across your blog and I love it! Thank you very much, Audra! What a lovely comment to receive :) I must admit I don't post here as often as I do in my other blog (http://chronicallyvintage.blogspot.com/), but I aim for at least one Girl Guide post a month, sometimes more just depending on what comes to mind or is new in the GG/GS community. Oh my gosh! What a fun hobby! I was a Girl Scout for just one year...I couldn't stand wearing the "flashes" the held up the knee socks! Hi M, thank you very much for your comment! That must have been unpleasant indeed! By the time I was a GG the uniforms had lost a lot of their prior formalness, so I can't say as though I ever had to wear flashes. I know this was an old post. Just looking on line about the All Round Cord and found your site. My wife was showing me her cord and talking about her years in guiding. Apparently from what she tells me she was one of the last girls in Canada to receive the All Round Cord. Pretty cool... and she still has it. Thanks again & have a wonderful year!